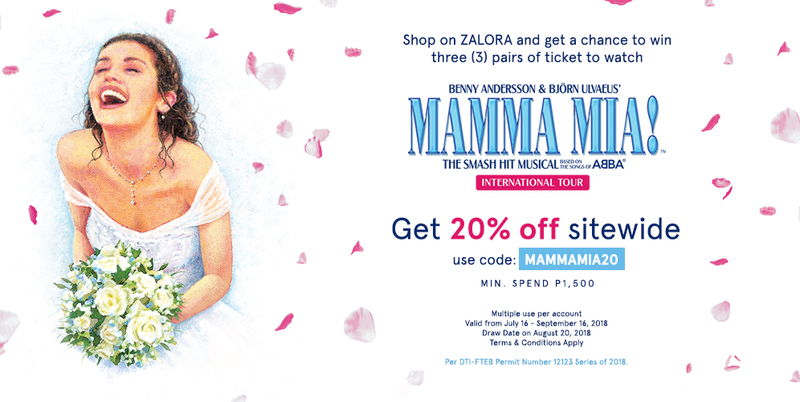 Shop on ZALORA and get a chance to win tickets to watch MAMMA MIA Live! July 16, 2018 – September 16, 2018. Promo period is from July 16, 2018 – September 16, 2018. This promotion covers the Manila shows of MAMMA MIA! to be held from September 29 - October 3, 2018 at The Theatre at Solaire. The said voucher code MAMMAMIA20 entitles the customer to 20% discount for a minimum spend of Php 1,500 on ZALORA in single purchase. Click on Shop Women or Shop Men to begin. Select size and click on “Add to Bag”. Once finished, click Checkout Now to proceed. Log in or Register by Signing in via Facebook. Input Customer Information such as name, phone number and delivery address. Click “Have a promo code? Enter it here”. Discount will be deducted from subtotal. A customer can earn more than one entry provided that he / she meets the requirements stated above. Three winners of two (2) tickets (A-Reserve, orchestra seats) to watch Mamma Mia in Manila at The Theater at Solaire. The winners have the opportunity to choose one among the playdates when to use their show tickets. All orders following the above mechanics must be valid and complete ZALORA orders. Cancelled, exchanged, returned, and fully refunded ZALORA orders will be disqualified. Deadline to earn raffle entry/entries for a chance to win the prize is until 11:59 PM of September 16, 2018. Raffle draw will be held on September 20, 2018 at 5:00 PM at the ZALORA Philippines head office at Level 2, Building B7, Bonifacio High Street, Bonifacio Global City, Taguig City with the presence of representatives from Department of Trade and Industry (DTI), Concertus Manila and ZALORA Philippines. ZALORA Philippines and Concertus Manila reserve the right, with the concurrence of Department of Trade and Industry (DTI), to reject a participant if he / she is unable to satisfy the conditions set out in these promo mechanics. Raffle draw winners will be notified through email, registered mail, phone call, and SMS by ZALORA Philippines. Winner must submit all documents within 8 days from receipt of any confirmation from email, registered mail, phone call, and SMS. Redemption of tickets will be from September 21-28, 2018. Winner must submit the original official notification letter; and present two (2) valid government issued IDs (i.e., SSS, Unified Multi-Purpose ID, Driver’s License, Voter’s ID) and one (1) proof of citizenship (valid Passport or Birth Certificate). Winner can submit the required documents through registered mail or email to sponsorships@ph.zalora.com or to ZALORA main office located at B7 2nd Level, Bonifacio High Street, BGC Taguig City. The ZALORA voucher code MAMMAMIA20 is applicable to participating brands except for brands and categories found on www.zalora.com.ph/faq-non-sale/. This offer is non-negotiable and not convertible to cash. This offer cannot be used on conjunction with any other TicketWorld or Mamma Mia! promotion. Concertus Manila shall not be obliged to replace any misplaced, lost or stolen tickets. Any dispute concerning the products or services of TicketWorld shall be settled directly between the ticket buyer and TicketWorld. The discounted tickets are valid only for this event, seat section and performance dates. Tickets cannot be refunded, exchanged or replaced if lost, stolen or otherwise destroyed. By participating in the raffle, the winners agree to cooperate and participate in any advertising or publicity activities of ZALORA Philippines and Concertus Manila relating to the draw. The winners agree that ZALORA Philippines and Concertus Manila may publicize the name and photograph of the winners in such mode and manner as ZALORA Philippines and Concertus Manila consider fit. Winners’ names and photographs may also be publicized in such mode and manners as ZALORA Philippines and Concertus Manila consider fit, such as but not limited to, ZALORA Philippines’ Facebook (https://www.facebook.com/ZaloraPH), Instagram (https://www.instagram.com/zaloraph), and Twitter (https://twitter.com/zaloraph); and Concertus Manila Facebook (https://www.facebook.com/ConcertusManila/). The links provided are not exhaustive and there may be other publicity channels. The schedule and location of awarding shall be agreed upon by the sponsor and the winner. If the winner is unable to claim the prize, a representative must present the following documents: letter of authorization duly signed by the winner nominating the representative as the acknowledged recipient on behalf of the winner, two (2) original government issued IDs of the winner (SSS, Unified Multi-Purpose ID, Driver’s License, Voter’s ID, Passport), and two (2) original IDs (SSS, Unified Multi-Purpose ID, Driver’s License, Voter’s ID, Passport) of the authorized representative. Prizes not claimed before the scheduled show will be forfeited in favor of Zalora upon approval of DTI. ZALORA Philippines and Concertus Manila reserve the right to verify the eligibility of the winning entry. ZALORA Philippines will verify the winner’s order (via the ZALORA website or ZALORA app), whereas the order should be a valid complete order, with no cancellations, exchanges, returns and refunds. Employees of ZALORA Philippines and Concertus Manila including their relatives up to second degree of consanguinity or affinity are disqualified from joining the promotion. Per DTI-FTEB Permit Number 12123 Series of 2018.